We are happy to introduce you our new WordPress theme with modern design. 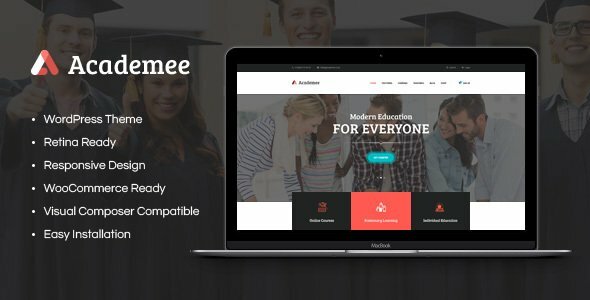 Academee is a perfect option for educational establishments like colleges and schools, as well as trainings and courses, both physical and online, also for language centers, tutoring services, etc. The theme becomes an easy fit for schools who offer different types of courses and classes, due to custom post type integration. An elegant design is compatible with the latest version of Visual Composer which makes it super easy to create your own page layouts. Besides that, the is compatible with such premium plugins, as Essential Grid, Revolution Slider, etc. Also, you have a chance to add an online store to your website in 5 minutes due to WooCommerce compatibility and respective resign integration.